A 126 MW gas fired cogeneration power plant built by Thailand's Samutprakarn Cogeneration Co., Ltd. began generating electricity on August 23, 1999. Ninety MW of its output is supplied to the Thai National Grid, with the remainder going to local companies. The plant operates 24 hours a day, seven days a week, and is shut down for 35 days once a year for maintenance. 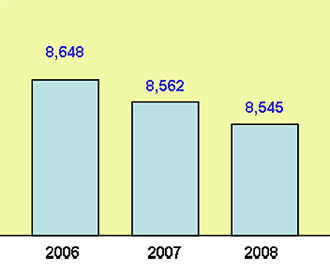 A major overhaul is done every six years. For improved efficiency, this power plant was designed to have more than one thermodynamic cycle, and uses both gas and steam turbines. Two GE gas turbines burn fuel to produce heat energy and generate electricity, and the waste heat is used to produce steam that passes through an Alstom steam turbine to generate additional electricity. The gas fuel for this plant comes from a PTT gas separation plant, which receives gas via an undersea pipeline from wells in the Gulf of Thailand. The plant's boilers utilize heat recovery steam generators (HRSG) with a capacity of 80 t/h (max.120 t/h) and a maximum allowable steam pressure of 65 bar. The steam temperature is 500 degrees Celsius. 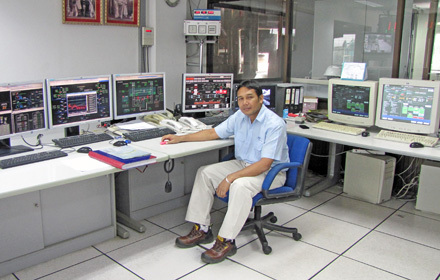 The decision by Samutprakarn Cogeneration to upgrade this plant's legacy distributed control system was made because it was proving difficult to procure spare parts from the system vendor. Yokogawa Thailand successfully installed the CENTUM CS 3000 system on schedule and on budget. With 90% of this plant's generated power going to the Thai National Grid, which is owned and operated by the Electricity Generating Authority of Thailand (EGAT), it is vital for the production control system to be highly reliable. 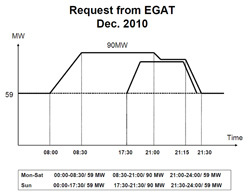 EGAT sends a power demand pattern every month (see figure) to the power station and it must generate electricity accordingly. 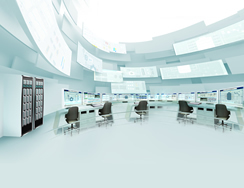 With an availability that exceeds 99.99999%, Yokogawa's CENTUM CS 3000 system has been key to meeting this requirement. 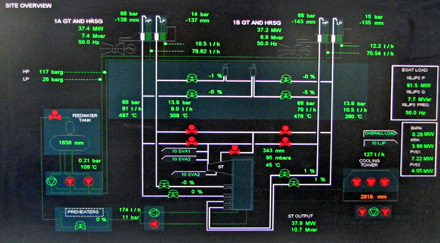 The Yokogawa CENTUM CS 3000 controls and monitors the plant's HRSG units and its balance of plant (BOP) facilities. Other vendors'systems such as the gas turbine and steam turbine control systems are all integrated through Modbus interfaces with the CENTUM CS 3000 system, so almost all plant data can be viewed at the CENTUM CS 3000 human machine interface (HMI) stations. Operators can clearly see in real time the status of the compressors and all other equipment throughout the plant, and thus have the information they need to take quick and effective action when necessary. This data is also used to facilitate equipment diagnosis so that engineers can schedule maintenance at the most appropriate time and ensure safe operation. Signals from a variety of analyzers are also monitored by the CENTUM system to control emissions. The continuous measurement of CO and O2 concentrations allows operators at this power plant to fine tune the air-fuel ratio and thereby boost combustion efficiency and reduce NOx emissions. 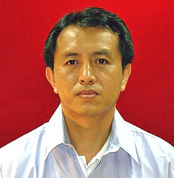 Kitpoat Srasomsub, Maintenance Manager, had the following to say about the plant's new control system: "We have been very happy with Yokogawa's CENTUM CS 3000 since introducing it in 2007. The system is very reliable and there have been no major problems with it. We have the important mission of providing a steady supply of electricity to both the EGAT national grid and local companies 24 hours a day, seven days a week, throughout the year. We are always striving to improve efficiency and reduce emissions through the visualization of all plant data."